One of the main goals of this blog is to help developers and data architects, just like us, with their Amazon Redshift operations, including Redshift security. Starting from a full comparison with Google BigQuery, explaining how to load Google analytics data into it and perform analysis using Tableau, all the way to providing you with tools such as PGProxy, which can help you load balance queries between multiple Redshift clusters, this article may extend your know-how on Redshift and help you do your job much better. Before getting into the step-by-step details, note that we are going to use one of Amazon’s main encryption tools, the AWS Key Management Service(KMS). This service allows for the creation and management of encryption keys. It is based on the envelope algorithm concept, so it requires two keys for encrypt/decrypt operations –– a data key to encrypt the data and a master key to encrypt the data key. 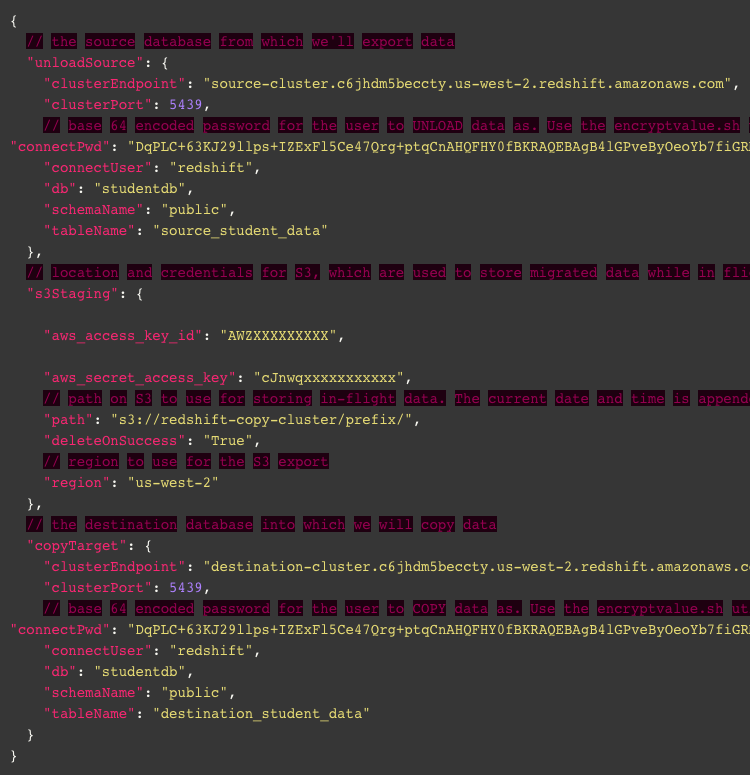 Next, we need to create two identical tables in Redshift, one for source redshift and another for destination redshift. 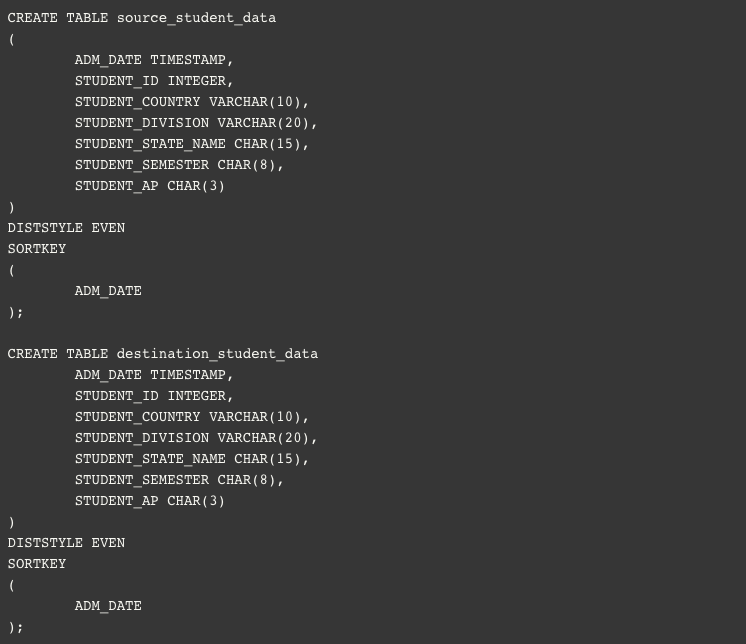 In source redshift we will create a table name “source_student_data”, and in destination redshift we will create a table name “destination_student_data”. We are going to use a Python script to automatically unload/copy our Redshift data, so we need to provide information beforehand. In this step, we will create a configuration file named ‘config.json’, where we will provide the Redshift cluster endpoint, database name, AWS access key, and S3 bucket, as well as the Base64-encoded password created in the previous step. We are using a Python script name, “redshift-unload-copy.py”, which will unload the source data from Redshift, then encrypt the data with the KMS master key and upload to S3, and finally copy the encrypted data from S3 to the destination Redshift cluster. 1- First of all, download the source file from this location. 3- Once the ‘copy.py’ file is edited, zip the whole folder again. 4- Now, in the AWS console, go to AWS Lambda. and create a function. 5- Click Create a Lambda Function to display the next page. 6- Select Blank Function to configure the triggers. 8- On this page, specify the Name, Description and Runtime environment. For our use case, the Runtime environment will be Python 2.7. From the Code entry type drop down list, select Upload a ZIP file and select the zip file we created earlier). 9- Provide the handler, role and existing role information, and click Next. 10- Click Create Function to create the function in Lambda. 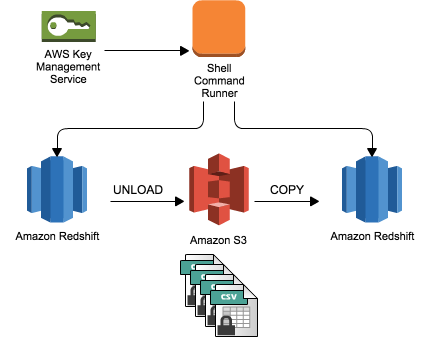 Using own KMS customer-managed keys allow us to protect the Amazon Redshift data and give full control over who can use these keys to access the cluster data. It is worth mentioning that with AWS services KMS and S3, encryption of your data loads is provided without any additional charge, though KMS has a limited free tier offer up to 20,000 requests per month. In the past, we had to meet our security professionals and ask them to integrate security into our data repositories, in large and complex environments we still do. However, we can also follow such guidelines which enable us, the data architects, to ensure the bare minimum when it comes to running our data solutions on the cloud, especially as one researches relevant topics including Redshift security. I hope this solution will help you do your work in a safe and secure data environment.